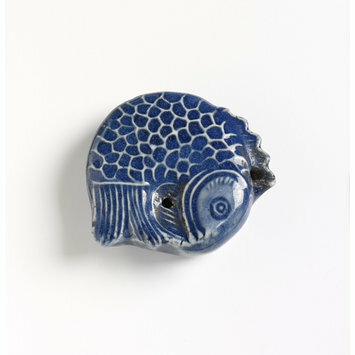 Korean water droppers such as this formed part of a set of accoutrements necessary for writing and painting. Before using the brush, the writer would prepare the ink by grinding an ink stick on an ink stone with a few drops of water dispersed from the dropper. The wide variety of shapes and designs that characterise water droppers of the 18th and 19th centuries displays the imagination and wit of their makers and consumers. This dropper is in the shape of a carp bringing its tail to meet its mouth. The small water dropper is carved to depict the eye, scales and tail of the fish.